Plants erect, (2-)3-5(-6) dm, gla-brous or occasionally tomentose. Aerial flowering stems erect, 0.5-1 dm. Leaves basal and cauline; blade oblong-ovate or rounded to cordate. Inflores-cences 10-45 cm. 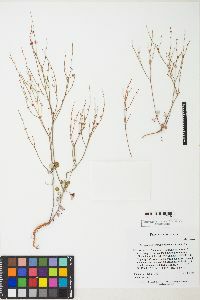 Involucres sessile and appressed to branches, cylindric, 3-3.5 mm. Flowers 1.8-2 mm; perianth white to rose or yellow. Achenes 1.8-2 mm. 2n = 24. Flowering Jul-Nov. Sandy to gravelly serpentine flats and slopes, mixed grassland and chaparral communities, oak and pine woodlands; 50-1600(-2100) m; Calif., Oreg. Variety luteolum is rather common in northern California, where it is seen primarily in the North Coast Ranges and across the northern tier of counties to the northern tip of the Sierra Nevada. It continues northward into southern Oregon. In some places, it can even be abundant or infrequently rather weedy. It is difficult to distinguish from E. gracile in the southern part of its range and from E. vimineum in the northeastern portion. A collection from Crook County, Oregon, (Steward & Steward 6199, KANU, IA, OKLA, PENN, UTC) seems to be this species rather than E. vimineum.